The N.C. Medicaid Managed Care proposal was put out today by the Cooper Administration NCMedicaidManagedCare. Don’t look now, but North Carolina looks to be engaging in bipartisan health care reform. You may recall that the Republican-controlled Legislature dictated that the Republican Governor develop and submit a 1115 Medicaid waiver by June 1, 2016, which he did. I submitted a comment on their plan with Aaron McKethan–some good ideas, some not so good. However, it was mostly an aspirational document and was not really detailed enough to warrant a CMS response. Governor Roy Cooper’s Secretary of HHS Mandy Cohen (and former COO of CMS under President Obama) was confirmed last Spring and immediately set out to lead a process that is putting the meat on the bones of the Republican Medicaid reform aspirations. She fully committed to moving it ahead, demonstrating that both political parties are searching for common ground on Medicare reform. It will take both sides to do something this big. A big team from Duke lead by Joseph Rogers has a new Paper (PAL HF) reporting the results of a RCT of palliative care in late stage Congestive Heart Failure, published today in the Journal of the American College of Cardiology. Patients who got palliative care had better quality of life, higher function and reduced anxiety and depression (with no survival difference, as hypothesized). Costs were not a primary endpoint, but will be analyzed in later work. After the publication of a RCT of early palliative care in stage 4 lung cancer in the NEJM in August 2010 showed improved quality of life, lower costs and longer survival, there was a move to see if such findings could be replicated in other diseases. This NHLBI funded study is part of that effort. Real world evidence is provided imperfectly, especially with respect to policy. One example from this paper. This studies’ exclusion criteria ruled out patients with anticipated heart transplant or LVAD implantation within 6 months. Arguably, these patients aren’t ready for palliative care because they are seeking such aggressive treatments, but from a policy perspective, it is arguable that they definitely need the goals of care type of discussions that are a key part of palliative care. The successful conclusion of a trial of CHF without patients on the way to heart transplant or LVAD implantation leaves an evidence hole, even as we add to the evidence base. Should patients thinking about an LVAD or a heart transplant get palliative care? I think the answer is yes, but this trial provides no direct evidence to inform this question. So, there remains an evidence gap (as always–good studies suggest more questions than they answer). However, the health care system often doesn’t and can’t wait for such answers, and in the case of palliative care there has been a tremendous increase in its provision at Duke, and across the nation since this study was began. The process and timing of research is slow, and the answers are often muddled, while the pace of change in addressing the needs of seriously ill patients is much more rapid. When one’s interest is policy applications, even an RCT–the gold standard of research–cannot answer all of the most pressing questions. The Senate’s Better Care Reconciliation Act (BCRA) is a significant modification to the current Patient Protection and Affordable Care Act (PPACA) exchange structure in a variety of ways. One major change is the designation of the benchmark plan which determines the level of subsidy that the federal government provides to individual buyers on a health insurance marketplace. There are two elements of note. The first is that the benchmark plan is now a plan with a calculated actuarial value of 58%. This is a significant change from the current benchmark plan with a calculated actuarial value target of 70%. More importantly for this post is the benchmark plan in the BCRA is the median qualified plan. Research has shown that consumers can be overwhelmed by too much choice. Dominated choices can and often will be selected. Buyers have frequently confused the value proposition of Gold and Bronze plans based on prioritizing either more out of pocket maximum protections or lower monthly premiums. Buying and using insurance is a complex task with significant uncertainty and cognitive demands. The BCRA subsidy attachment system creates incentives for insurers to further increase complexity. Within PPACA the incentive for insurers to clone plans with minimal meaningful differences between them only applies to the insurer which controls the least expensive Silver plan in a county. This single, low cost, insurer faces a decision as to whether or not to design a second plan with the same actuarial value in a slightly different cost sharing structure in order to guarantee that this single carrier controls both the least expensive and the benchmark Silver point. All other insurers plan offering decisions are made independent of subsidy attachment point manipulation purposes. The BCRA creates a broader and more complex strategic design problem for carriers. Every entry in the benchmark category influences the benchmark price. Once an insurer has built a network and performed the basic actuarial calculations, modifying a basic plan design by altering co-insurance slightly or decreasing deductibles while increasing co-pays to achieve a constant actuarial value is a fairly low cost action. A high cost carrier can introduce an isomorphic plan design to increase the benchmark and asymmetrically decrease the relative post subsidy price of its preferred offerings. Low cost carriers have an incentive to offer one more plan to lower the benchmark and make its offerings more attractive compared to higher cost peers. Counties with multiple insurers will face an unstable equilibrium. Every insurer will have an incentive to add a marginal, incremental plan to be offered on the BCRA exchanges in order to move the subsidy attachment point closer to their preferred position. Once this arms race begins, consumers will be asked to differentiate miniscule differences between dozens of plans offered by two or more insurers. Common heuristics such as evaluating a plan first on the inclusion of a specific doctor or hospital in network and then examining a subset of plans based on maximally acceptable premium with the final decision step based on minimizing deductible will be corrupted. Plans can be offered with low deductibles but higher maximum out of pocket exposure with a cost structure that significantly advantages or disadvantages certain types of consumers. Insurance buyers will face decision fatigue and be overwhelmed with almost meaningless choice. There are two possible solutions. The first is for the Department of Health and Human Services to update stringent meaningful difference regulation. Current regulation allows carriers to offer multiple plans built on the same network ID and same plan type (HMO, POS, EPO, PPO) with fairly minor differences in cost sharing. Stronger meaningful difference regulation would restrict carriers to offer only a single cost sharing design per network ID and plan type dyad. The second is for the Senate to modify the benchmark. Every participating carrier would place their lowest cost plan in the benchmark set and the median plan from the benchmark set would be the benchmark plan for the county. These design modifications lower consumer confusion and will minimize strategic manipulations of the subsidy formula which will lead to more effective and efficient markets. Does Health Insurance Improve Health? 1 life saved for every 239-316 persons newly covered by Medicaid (the range represents the uncertainty in the estimate–could be as high as 316 lives saved, or as low as 239, for each newly covered person). The evidence base changes weekly. These two important papers need to make their way into the ongoing policy debates. The Senate healthcare and tax cut bill is expected to drop soon. Here is a cheat sheet on how to read it. a) The Parliamentarian is most likely going to be stripping out significant, non-germane to the budget, items that were in the House bill. b) $1 billion in savings must come from each of two committees (HELP and Finance). c) Anything the Senate passes must meet or beat the $119 billion in budget window deficit reduction that the House AHCA was scored at. Any extra dollar used to pay for a slower Medicaid termination has to come from either Medicaid on the back-end, fewer tax cuts or lower individual market changes. Anything used to up subsidies on the individual market has to come from itself, faster/steeper Medicaid cuts or fewer tax cuts. Anything that ups the tax cuts must come from the individual market or Medicaid…etc. Slower terminations but lower index rates on per capita caps is a budget gimmick. It gives a little bit of money in the 10 year budget window but leads to massive cuts in the out years against the current counterfactual. b) How does the individual market function without a mandate and without the patient and state stability funds? The Silver plans are supposed to be 70% Actuarial Value (AV). AV is the percentage of costs for the pool that the insurer covers. 70% AV means the insurer pays roughly 70% of the costs, and the people in the pool pay roughly 30% in cost sharing. There are lots of different ways to arrange the cost sharing but that is a detail. Under the Obama administration, there was a de minimas variation rule where a plan could be called Silver if it was between 68% and 72% AV. The Trump administration released a new rule that changed the allowed variation for a Silver plan to range from 66% to 72% AV. The highlighted counties have a Silver plan with a 2017 AV between 68% and 68.05%. I figure that companies are more likely to do what they were doing, reaching for the lowest possible AV if the rules are relaxed. Counties where the lowest AV was above 70% are, in my opinion, less likely to see their incumbent carriers race to the bottom as they already had not shown that proclivity. This is most of Oregon and significant chunks of Pennsylvania and Illinois with a few random counties elsewhere. The distributional consequences are complex. Lower AV values, all else being equal, means lower premiums. The insurers pay less in claims. It is a good deal for the federal government as the premium of the benchmark Silver will either be constant or decrease so advanced premium tax credits will decline. 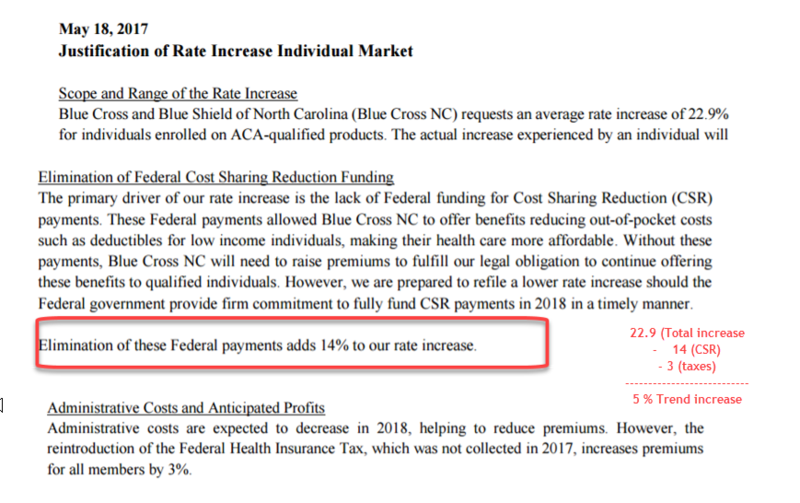 It is a win for healthy people who are not subsidized as they weren’t going to hit the previous, lower out of pocket maximum anyways so they save 3% in premiums. It is a wash for people with Cost Sharing Reduction (CSR) subsidies as the CSR holds constant. It is a wash for subsidized buyers who don’t get CSR but who are healthy and were going to buy Silver anyways. It gets complex for those buyers who wanted to buy another metal band as county specific pricing variations will be altered. Bronze plans will be slightly more expensive and Gold/Platinum plans will be up in the air as to their relative price. The worst off are the Silver buyers who are not receiving CSR assistance and who are likely to be sick. They are picking up more out of pocket. Non-subsidized buyers will get a slight improvement in lower premiums but all that plus more will go back out the door via higher cost sharing. Subsidized buyers won’t see the slight improvement in premiums. They will only see higher cost sharing. Finally, the Tableau that I was using to play with this idea is below. Blue Cross and Blue Shield of North Carolina just filed their initial rates for the ACA individual market for 2018. The headline will be that they are asking for a 22.9% average rate increase. The second headline is that they assume that Cost Sharing Reduction subsidies will not be paid. That assumption drives 61% of the rate increase. The SERFF filing is here. There is subtle good news in the rate filing. Another 13% of the rate increase is driven by the reinstitution of the 3% Health Insurance Premium tax. That is a one time hit that is to be baked into the cake of future rates. This means only 26% of the entire rate increase or roughly five percentage points is due to increased medical costs or service utilization. Trend and morbidity is under control. Below are segments of the consumer justification. 5% trend is a healthy trend. That is a the trend of a market that is fairly stable and reasonably priced. There are a few other North Carolina notes for the individual market. Aetna is withdrawing. This should allow Blue Cross and Blue Shield to play aggressive subsidy attachment pricing strategies. Subsidized buyers have the chance of seeing excellent deals on the Exchanges if BCBS-NC prices in the same manner as BCBS-Tennessee prices in their single carrier counties.